ADJUSTABLE CASE FITS MOST PHONES: iPhone 6/6s/7/8/ 8 Plus, Samsung Galaxy S6/S7/S8/S8 Plus/ S9 Plus, Google Pixel, etc. Even with an Otterbox Case! QUALITY AMISH MADE: Handcrafted in the USA to ensure quality! Backed by our 1 year warranty. DURABLE: Heavy-duty, Black Oxide clip firmly holds onto your hip, keeping your phone within reach! PROTECTION: Elastic webbing expands to accommodate your phone, but also firmly holds it in place, even if the case tips over! INNER ELASTIC POUCH: The perfect place to hold smaller phones, credit cards, or a key. Smart Phone are expensive, so buy a case you can trust! The XL Universal Cell Phone Case is the perfect multi-purpose companion for large smartphones and will last longer than your cell phone provider's contract. Our amish made phone holster has an adjustable strap to fit even the largest smart phones like iPhone 8 Plus, iPhone X, iPhone 7 Plus, Samsung Galaxy S8, S8 Plus, S9 Plus, and the Google Pixel 1 and 2 EVEN WITH AN OTTERBOX CASE. The heavy-duty slip-proof black metal oxide belt clip firmly grips your belt or waistband and wont come loose or fall off when you pull out your phone. Our phone case is Proudly Made in the USA! Our case has ultra durable stitching throughout with double stitched seams on stress points for added strength and durability. Backed by our 1 year warranty! 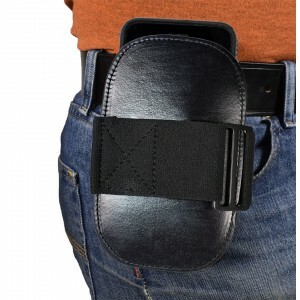 Keep your phone safe with our adjustable holster case.